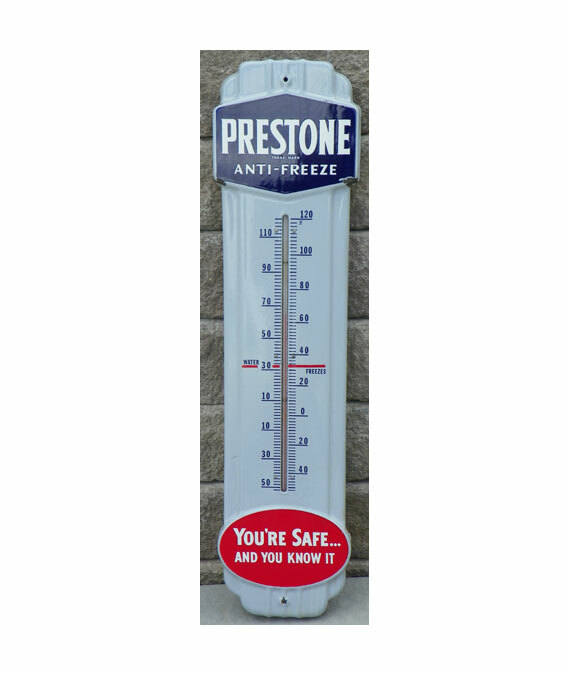 THIS 1930’s-40’s PRESTONE ANTI-FREEZE THERMOMETER IS GUARANTEED 100% ORIGINAL and OLD. MADE of PORCELAIN OVER STEEL. STILL WORKS. THERMOMETER HAS A FEW MINOR CHIPS, MINUSCULE SCRATCHES/SCUFF MARKS BUT STILL DISPLAYS GREAT! EXCELLENT COLORS TO PORELAIN FINISH. COMBINED SHIPPING DISCOUNT OFFERED ON MULTIPLE PURCHASES. 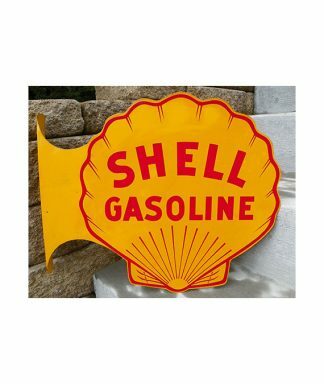 THIS SHELL FLANGE SIGN IS GUARANTEED 100% ORIGINAL & OLD. SIGN IS IN EXCELLENT CONDITION. NEVER USED, NEVER MOUNTED. STILL DISPLAYS GREAT WITH EXCELLENT COLORS TO PAINT FINISH . HAS SOME LIGHT SCRATCHES, LIGHT WEAR, SLIGHT SOILING TO FINISH AND MINOR SCUFF MARKS BUT STILL SHOWS WELL. ONE SIDE HAS RUB MARKS DUE TO POOR PADDED DURING TRANSPORTATION THAT REMOVED AN AMOUNT OF PAINT TO THE LETTER “I” AS SEEN IN THE PHOTO. MEASURES 21″ X 18″. MADE OF PAINTED METAL. I will ship within USA only (NO INTERNATIONAL SHIPPING. 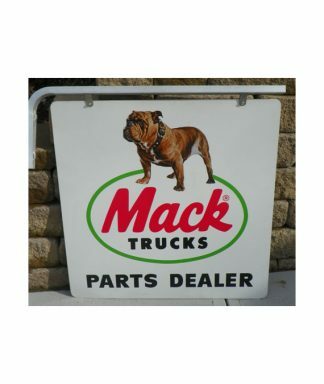 THESE CLASSIC MACK TRUCKS “BULLDOG” SIGNS WHERE USED BY MACK TRUCK DEALERSHIPS DURING THE 1950’s – 1960’s. We SOLD a similar Mack Trucks sign just like this one about two years ago and now we are happy to offer this SECOND one for your consideration. THIS OLD ORIGINAL (DOUBLE SIDE) MACK “BULLDOG” TRUCKS PARTS DEALER SIGN with ORIGINAL HANGER SIGN IS GUARANTEED 100% ORIGINAL & OLD. Sign measures 33″ X 33″. SUPER CLEAN. STILL DISPLAYS GREAT! EXCELLENT to NEAR MINT OVERALL CONDITION WITH GREAT COLORS TO PAINT FINISH. THIS EARLY (1930’s) PLYMOUTH SERVICE DEALERSHIP PORCELAIN (Double Side) SIGN IS VERY HARD TO FIND IN THIS EXCELLENT ORIGINAL CONDITION. Complete with Iron Hanging Bracket. 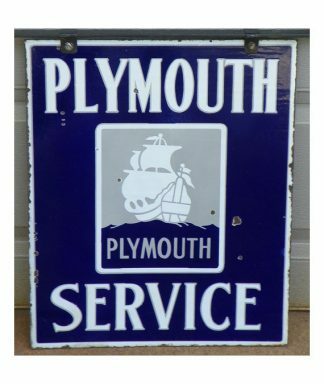 This PLYMOUTH SERVICE Porcelain sign is GUARANTEED ORIGINAL AND OLD. This SIGN has just the right “period correct” old look. Made of very Heavy Porcelain over thick metal. NO Repairs, NO Touch-Up, NO Clear Coat. Sign has minor age chips, minor wear, and minor scratches BUT CERTAINLY NOTHING SERIOUS AT ALL. Minor wear and nicks on hanging bracket. SIGN HAS VERY STRONG COLORS WITH NICE GLOSS TO FINISH. Great size for easy display. Sign measures 22″ X 18 and 32” x 30” Overall to Include bracket. 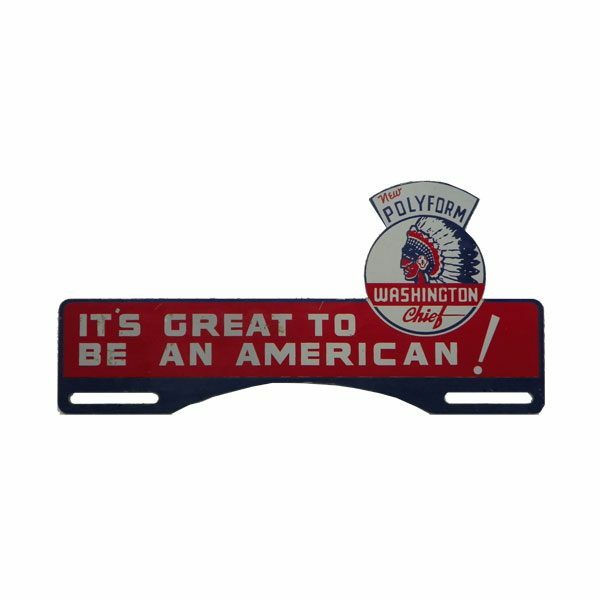 *Recently, a similar 1930’s Plymouth Service Porcelain sign sold at a Morphy’s Kyle Moore collection auction for $4,270.00 plus a buyer’s premium. Buy this excellent example with a bracket for a bargain price. ULTRA RARE, LIGHTLY USED and WELL PRESERVED TOPPER. A MUST HAVE FOR ALL TOPPER COLLECTORS. THIS TOPPER HAS MINOR AGE WEAR, MINOR SOILING, MINOR NICKS/SCRATCHES, MINOR STAINS THAT PROVE ORIGINALITY AND, STILL DISPLAYS GREAT WITH EXCELLENT COLORS. VERY CLEAN TOPPER!! MADE OF PAINTED METAL. Copyright © Vintage Concepts Signs LLC. All rights reserved.